The PEI Business Women’s Association is celebrating its 25th anniversary with a special gala evening. Members and guests will salute the women that have been integral to the success of the organization. The anniversary gala will be held at the Culinary Institute of Canada, 4 Sydney Street, Charlottetown, on October 25th from 6:30 – 9:30 pm. Key PEIBWA members from the past 25 years will be honoured throughout the evening. 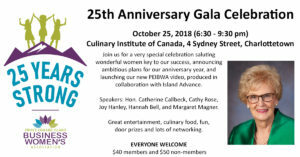 In addition to speakers, the gala event will include entertainment, culinary delights, door prizes, a cash bar, networking helping PEI Business Women’s Association celebrate 25 years! Everyone is welcome to attend. Event registration is now open. You can register at http://www.peibwa.org/event-3088937/Registration or call the PEIBWA office at 902.892.6040. Members $40, Non-members $50, Students $25.